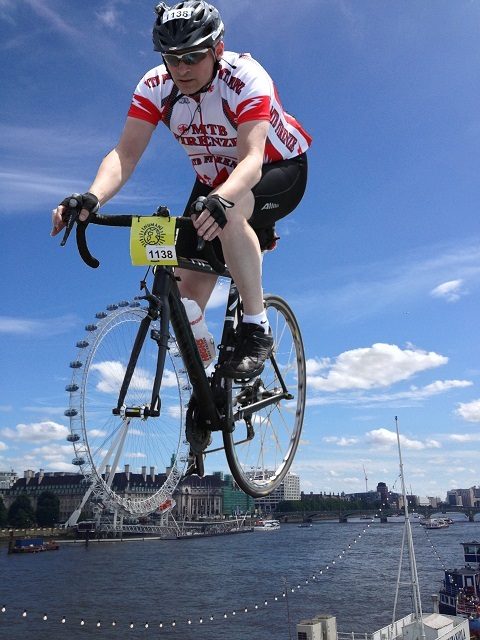 Thankyou to all my sponsors you raised over 1000 pounds for Mind Charity. Apologies for not posting immediately, but have been recovering and sorting out all the video / photos etc. – This is how the day went. I eventually got some sleep (about 5 hours) so I was feeling not too bad when the alarm woke me up. I stuffed a ton of carbs into me for breakfast, 3 slices of toast, some porridge and a croissant with a generous slab of butter, a large coffee and some apple juice. After that I was ready to go back to bed, but before that there was the business of the day to attend to. I hopped onto my trusty steed and cycled down to the start point in the Olympic park, just as the sun was climbing above the stadium. 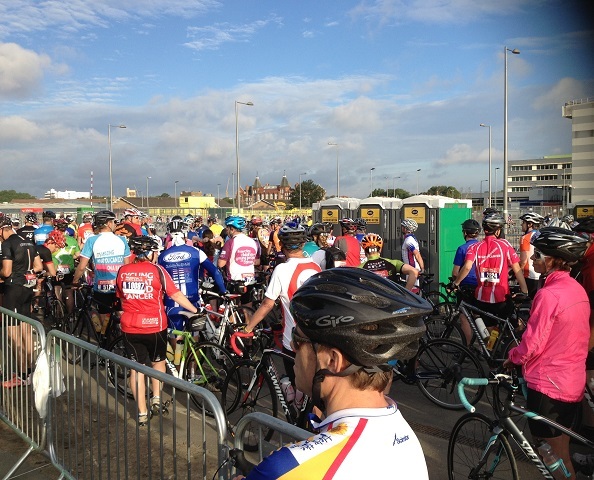 I was in “Wave P” so this meant finding the loading zone and getting organised for the start. Lambs to the slaughter ? Each wave was set off every 10 mins or so, with each departure getting a huge countdown and cheer as they started. The poor guy on the mic was trying to get the crowd going but I am not sure if it was the nervousness or the very early hour – but he was struggling to get a response from everyone. Eventually the time came 3,2,1 hooter sounds and we roll out the gate. Nice and easy for the first 2 miles – just to wake the legs up and warm up a bit after standing still. Your actual start time does not register until you are 2 miles in. They do this to let everyone get organised on the road. You see a huge sign “0 KM – Start” and you roll over a mat on the road and you have started for real. It was very strange to be riding a busy dual carriageway with no cars, it was a bit like something out of a Zombie Movie. We passed a few people out getting their Sunday papers and got a few cheers, especially from the overhead walkways. A nice downhill into the tunnel was very eerie, everyone was still riding on the left, I guess we are conditioned to think there may be a 10 ton Lorry about to fly around the corner, but not today, the roads were all ours for one day. I kept the pace very sensible for the first part, used as many groups as I could to get a tow. (sitting behind another cyclist saves you a lot of energy) Small groups were starting to form up and it was interesting to watch the dynamics on the road. The trick was to find some people going at the pace you want but who knows what they are doing in a group otherwise you risk an early accident. 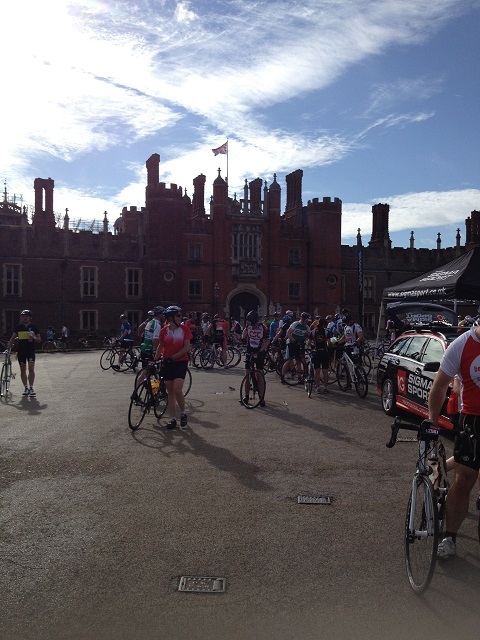 First watering hole was Hampton court palace. I didn’t need much water to fill up but the photo opportunity was too good to miss. Quick top up and on we go. Quick refuel and a photo opportunity. 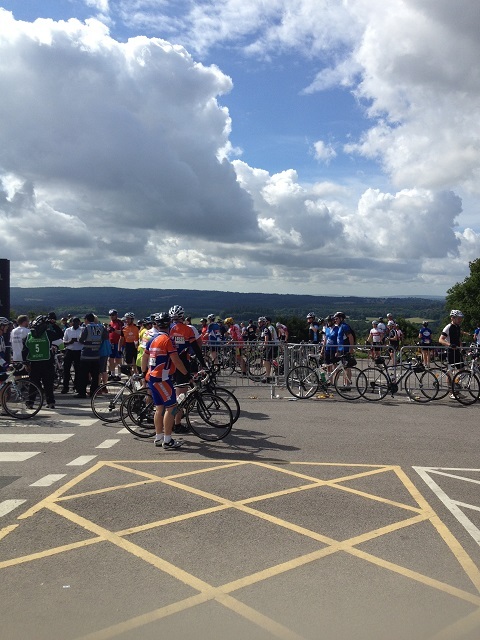 I refuel the water at the top, a quick photo and then down the other side and onto Leith Hill. The roads are getting narrow now and things are getting a bit more bunched up. I stay out of trouble and do my own thing through to the start of the climb. Knowing the roads really helped here as you can get in front and not risk someone taking you out by over braking or losing it on a corner. I ease the pace right back a kilometre from the climb and let the legs rest before joining the mass of people all working their way up the biggest climb of the day. Some were pushing their bikes up, some trying to overtake and some looking like they are gonna blow up with the effort. The guy next to me slowly comes to a halt as his energy faded. As he ground to a stop he didn’t manage to get his feet out of the pedals, there is a sort of slow motion topple as he went down, followed by a ton of swearing and 2 more behind crashing into him. I didn’t look back at the carnage, just kept my line and climbed to the top. A quick water refill and a photo opportunity with this guy who had just dragged his arse up the hill and I was off down the otherside. I flew down the backside of Leith Hill, on through Dorking and onto Box hill, which I can ride a bike up in my sleep now (I have forgotten how many times I have been up here) I did my own thing again all the way up with no drama and smiled to myself as now there was nothing more tricky between here and London and the finish. 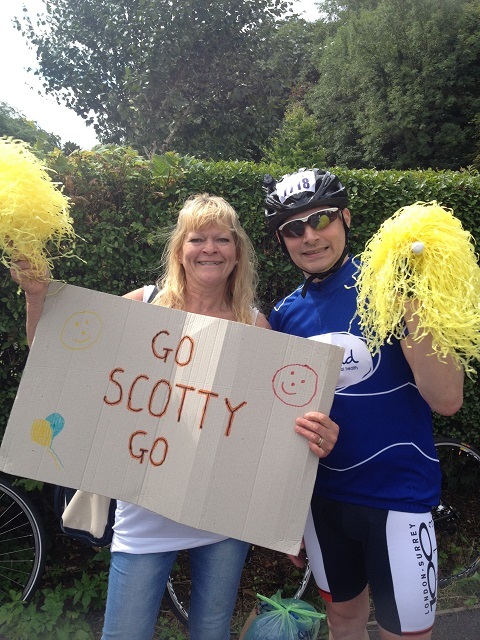 Onwards then onto Leatherhead for a quick refuel stop and photo opportunity with Mrs Collins (my chief support crew) – Many thanks for the boost, I really needed the support at this point as this was about 80miles in – which is the distance I had trained to. Now I was running on the atmosphere and willpower to get me to the finish. 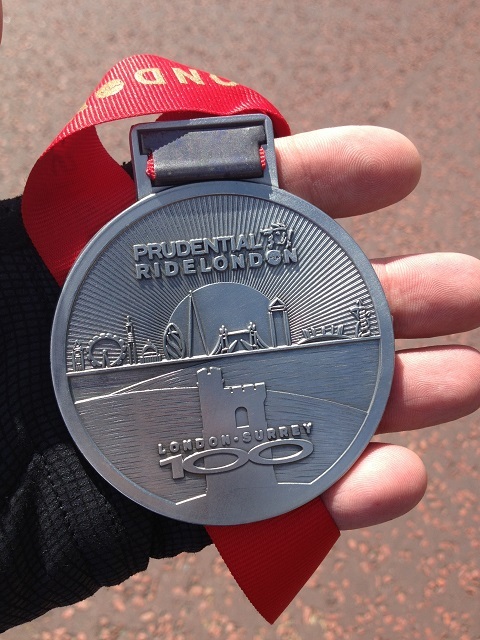 It was the best 6 hours I have ever spent on a bike !!! 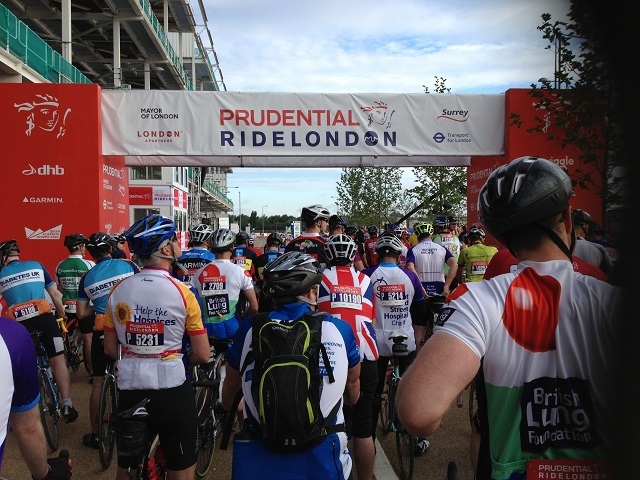 SO will I be back for Ridelondon 2014 ??? HELL YES !! The machine for 2014 ? Well here we are, less than 24 hours till the off. The training had been done (we will see if there has been enough tomorrow) The only test is to see I there is 100miles in these old legs. That we will find out tomorrow. 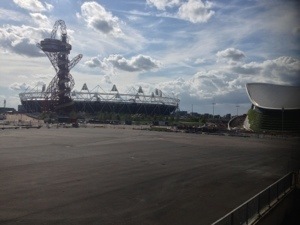 I took the train up to London today and then started a gentle ride across to the Olympic park. (I have booked a cheap hotel near the start) The old streets of London are familiar due my university days. 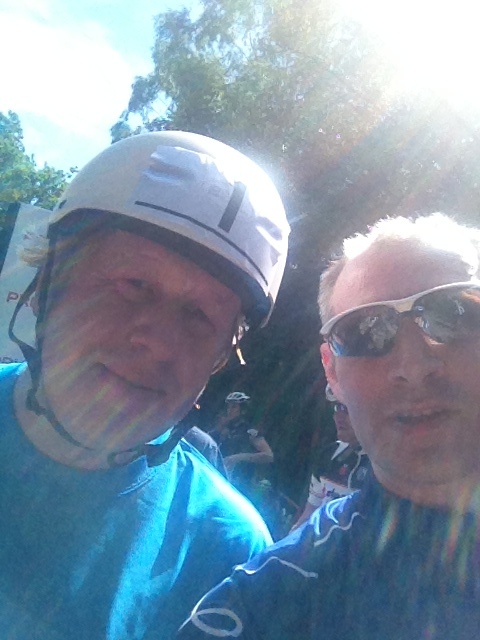 I came across the Ridelondon free cycle route. 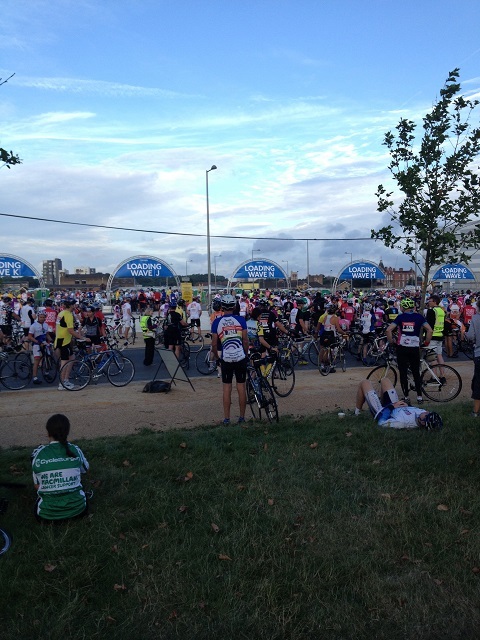 Closed roads – 8 mile circuit past all the London landmarks so I joined the 1000s of cyclists and did a lap. All sorts of people were filling the roads quiet a few tourists on “Boris Bikes” had decided to join in. Loads of little kids and the world and his wife. Great to see the roads shut and give everyone an excuse to get out and just enjoy the city. The mini festivals were great at Tower Hill / Green park and St. Paul’s. Loads of fun stuff to do and see. I took a walk to the start line – the Olympic stadium still looks very impressive and I see they are doing some work on the velodrome which will make it available to the public soon I hope. The park is definitely going under some redevelopment – hopefully to make the most of the facilities for the future. I remember seeing the Seoul Stadium of 1988 some 10 years after and it looked like a disused multistory car park. I hope there are better plans for the facilities here. I am now engaging in some last minute fueling at a pizza stop in the Olympic park. Early start tomorrow – load time of 6:54 start at 7:34 …. Finish time ? Well I let you guess at that.